Roope KANTOLA, 23, is the new men’s singles Finnish champion. Women´s title was clinched by LUO Yomo, 18. It is the first title for both players. LUO´s championship run was historic. She is the first championship winner in Finland ever, who was not born in Finland. She moved to Finland 2012. In men’s singles the biggest favorite was Benedek OLAH, playing already among 200 best players in the world. He had won the previous four championships. In his quarterfinal against Toni SOINE the left-handed SOINE beat him 4-3. The becoming champion KONTALA also had difficulties in his quarterfinal with Aki KONTALA. KONTALA had 10-6 lead and a total of five match balls in the seventh game. In semifinal KANTOLA was beating Timo TAMMINEN, the 2007 champion, who in his quarterfinal stopped the way of the old veteran and former multiple champion Pasi VALASTI. VALASTI now had completed his first national championships since 1986 without any medal. Roope KANTOLA´s final opponent was Mika RÄSÄNEN, the current executive director of FTTA. RÄSÄNEN won Samuli SOINE in quarterfinals and older brother Toni SOINE in his semi. The final was very even from beginning but in the last two games KANTOLA started to rely more on his backhand and took sixth and seventh games quite easily. ” I played especially well in semifinal and the final was not bad at all”, KANTOLA commented after his first national title. Women’s singles started without Anna KIRICHENKO, suffering from a foot injury. KIRICHENKO was – like Benedek OLAH – the title holder from four previous championships. Born in China in Nanning, Guanxi province, where she also started to play table tennis, LUO Yomo dominated the final against the 14-year-old Annika LUNDSTRÖM and took a clear 4-0 win. One day earlier, in the qualification group, the numbers were as clearly 3-0 but for Annika. ” I was tactically much better in the final and managed to keep Annika´s dangerous backhand opening in check”, Luo was telling after she had arrived from a doping test that after the final took plenty of time. Men’s doubles champions were Roope KANTOLA and Benedek OLAH. Olah also won mixed doubles with Elli RISSANEN. KANTOLA and OLAH were thus double champions. Women’s doubles championship was taken by Annika LUNDSTRÖN and Pihla ERIKSSON. 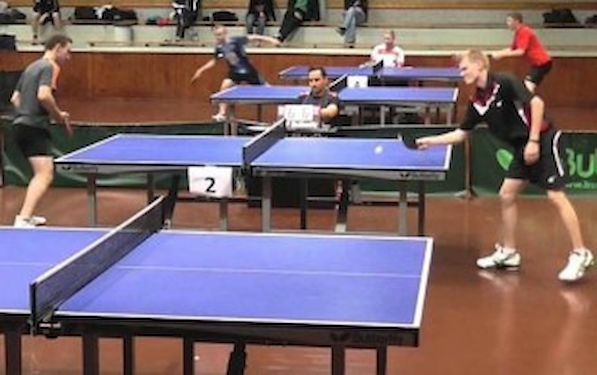 Finnish Championships was played, after many years, in the national table tennis “sanctum” Ruskeasuo. An audience of a full venue was following the event.